A few weeks ago, I shared a week's worth of dreams with you. While I've heard it said that no one cares about your dreams but you, I kind of like hearing about other people's especially weird dreams. Yesterday at work, for example, one of the CAD designers told me she had dreamed her friend had a baby and named it "Saggy." Gross! Lucky for her, though, (and you) I had quite the strange dream the night before, myself. 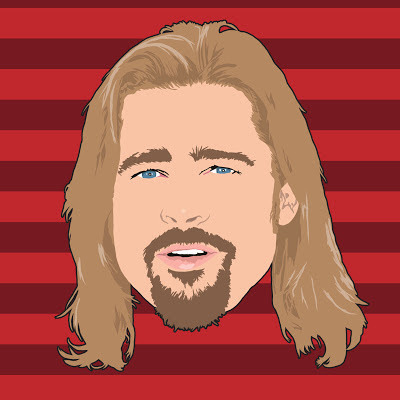 In my dream, I was in a restaurant, and I noticed Brad Pitt was there. Trying to be cool, I turned back around and continued with my dinner. About midway through, though, I had to go to the restroom, and when I walked in, there was a woman walking in just before me. She seemed a little giddy. When we got inside the lady's room, I saw that the woman was looking at the handicap stall. Then, in the stall, I saw that Brad Pitt was standing in the doorway, having disrobed and looking at the woman as if to ask her to join him. She giggled and looked back at me as if to say "who am I to say no?" The woman went inside the stall, and I didn't really know what to do. I was expecting to have to leave and come back later, but while I contemplated, Brad Pitt strangled the woman to death, and she fell to the ground. I panicked, but now Brad Pitt inexplicably was dressed and had a gun and was after me. Realizing I would never get away, I just turned to face him, and opened my arms for him to shoot me. He did shoot me, and I fell to the ground, but I only took a short nap. When I realized I was still awake, I made for the door. Just when Brad Pitt was about to shut the door on me and shoot me again, though, I woke up. Thank goodness that was a dream. That was almost more than a spinster could handle in one night.